There is an unusual show taking place in Baltimore right now, which has elements of magic, history and P.T. Barnum. The show is called Humbug: The P.T. 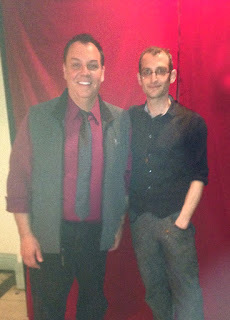 Barnum Seance and is put on by magician David London. The show/seance takes place at the Peale Center in Baltimore MD. The show is divided into two parts. The first is the historical part of the program. 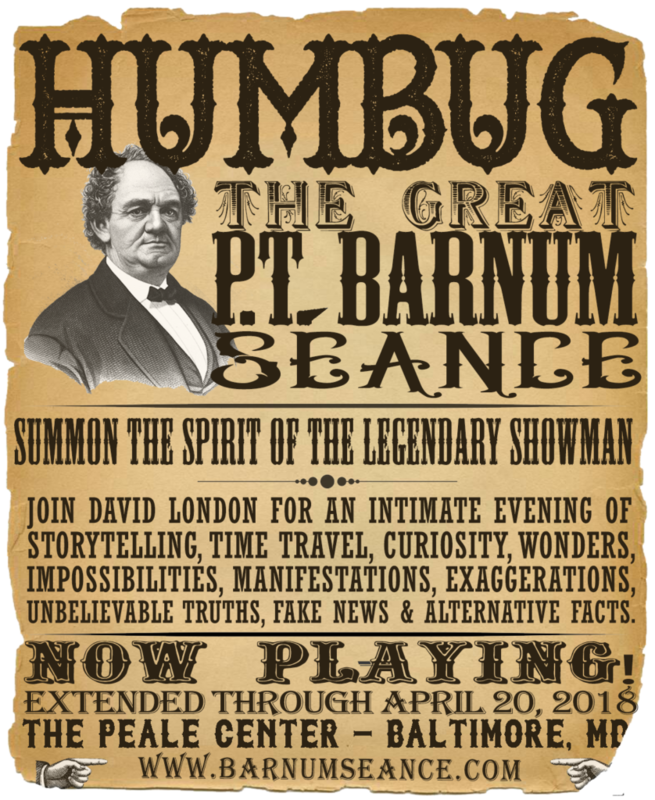 David London shares a great deal of biographical information about Barnum during this section. He also introduces many artifacts and pieces of genuine* memorabilia. In the course of his talk, the entire wall behind him gets decorated with posters, photos, and unusual objects and curiosities. 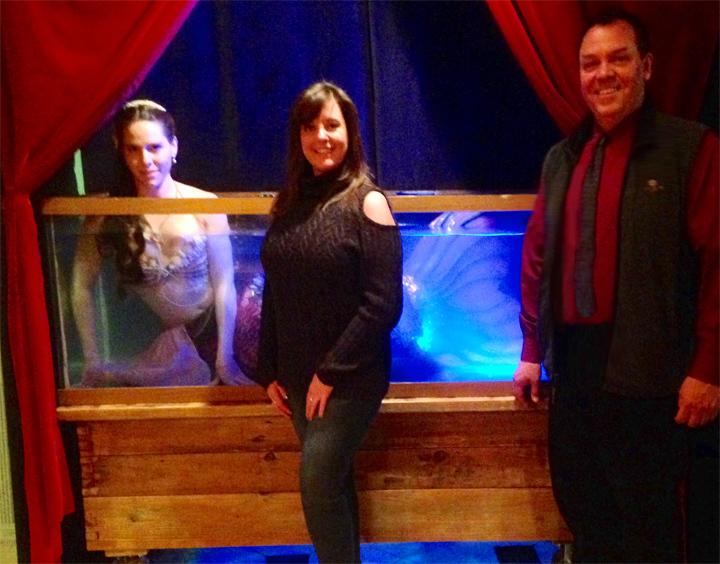 meet the Bearded Lady, and see a live mermaid inside a huge tank of water. The mermaid might have been my favorite thing all night to be honest. This is due to the fact that I'm currently fascinated by mermaids and am trying to figure out a way to get on in my show. In the Barnum program, she is a curiosity, in other words, she is there on display, and will gladly converse with you and take photos. The mermaid on this night was Morgana Alba, and she is part of the Circus Siren Pod group of mermaids. David London told me he knew people would be expecting to see something like the Fiji Mermaid, so he thought, 'why not give them the real thing!?!' I agree, she is a great addition. Getting back to the program, while David shares his various Barnum artifacts, they are distributed among the audience. Everyone gets a first hand look at everything. This was a great idea and really set things up for the next part of the program, the seance. But first there was an intermission. The attendees had a few minutes for a bathroom break and could check out the gift shop, with many more unique items for sale. The Seance room was closed off during the lecture part of the program. It was still in the same room, but partitioned off by sheer curtains. Now the curtains were open, and the Seance table was revealed. 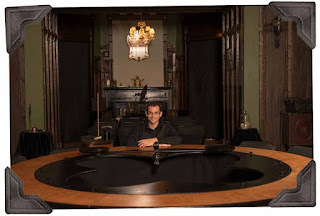 Let me state, this Seance Table is amazing. David told me he had it custom built. I'm assuming it was his design, and it's just incredible. 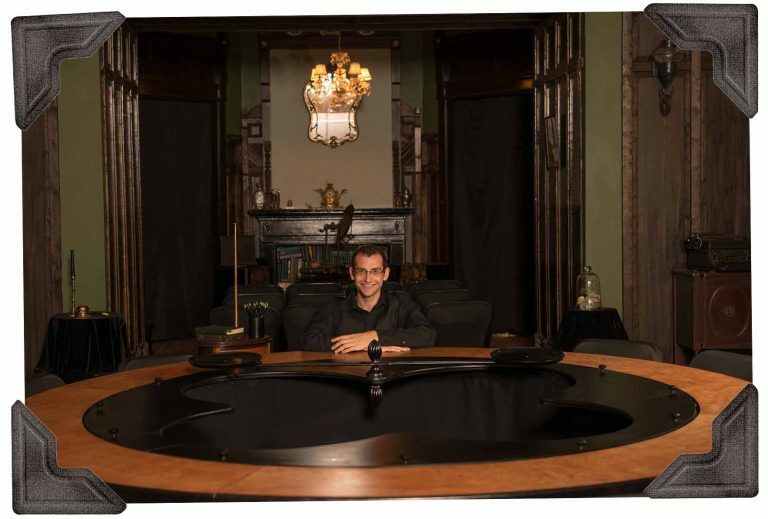 It's a large circular table that is open in the center. The table top is made in two sections. One part is stationary, the other part spins, like a lazy-susan. This allows anyone around the table (The Inner Circle) to access the center of the table with ease. A long bar with two trays on both ends pivoted into and around the center of the table. It's best to look at the photo, but even that doesn't do it justice. It's just incredible! I don't want to say too much about the Seance, because I don't want to give anything away. I will say I liked the way David used many of the previous seen artifacts within the seance itself. Were there manifestations? Did the ghost of P.T. Barnum make himself known? I won't say. I will say, that one young college student about came out of her skin when something unexpected happened. And another gentleman sitting at the table, also became a bit unglued during the proceedings. By the way, David London, is also working with the Jewish Museum of Maryland on an exhibit called Inescapable: The Life and Legacy of Harry Houdini. This will debut this summer, June 21st. If you'd like to read more about Houdini in Baltimore, I've got one article up and there are more coming later this year. 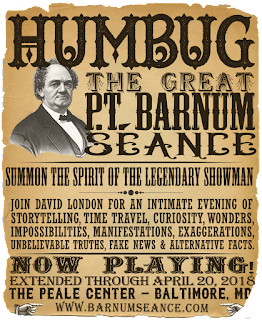 Oh, and if you missed my articles on Barnum, there were two which you can check out here.